I’ve written plenty about Oktoberfest and the Märzen-style beers typical to the season, most recently in “Beery Odes to Autumn.” So let’s get right to the head to head knockdown before us. 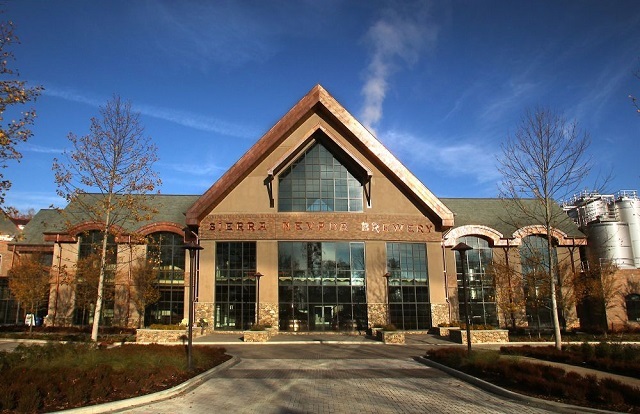 I was going to say it was a bi-coastal battle between Vermont and California, but the chances are about 100% that the Sierra Nevada brews I bought came not from the Chico, California headquarters, but the newer east coast plant in Mills River, North Carolina. So even playing field there. And both beers are collaborations with German brewers, so no handicap there, either. When Otter Creek expanded two years ago it installed a new 120-barrel system built by BrauKon of Germany. BrauKon has a pilot brewery outside of Munich called Camba Bavaria, hence the seeds of Otter Creek’s first international collaboration; this is the second year that the resulting Oktoberfest recipe has appeared. Beyond “German malts and a healthy dose of traditional German noble hops,” the Otter Creek website is a bit vague about the ingredients. I’m waiting for a response about which noble hops were used (Hallertau, Saaz, Spalt, Tettnang). Sierra Nevada has taken a different tack, collaborating with different German breweries every year since 2015. Aside from the use of a heritage German malt called Steffi in each brew, the recipe has changed each year with the various breweries (Riegele, Mahr’s Brau, Brauhaus Miltenberger). This year SN took up with the world’s oldest brewery, Weinhenstephan, which has been around since 1040, long before the original Oktoberfest bash in 1810. SN lets it all hang out on their website, noting the Steffi malt along with Pale, Pilsner and Munich; Sterling is used for the bittering and Sterling, Spalter and Record as finishing hops. I might as well admit at the start that’s it not really much of a fight. I think I’ve had two six-packs of both beers in the last few weeks and after twelve rounds neither beer is bloodied and I’m declaring a draw. 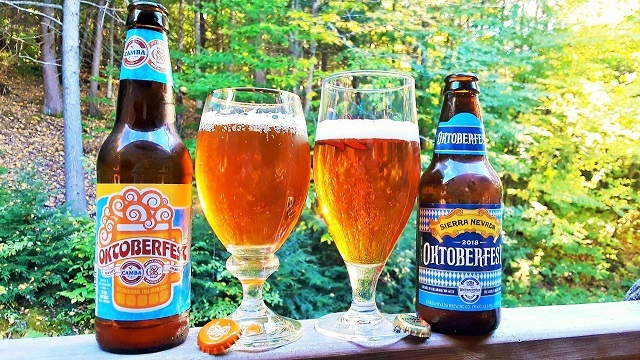 It’s no surprise to learn that both finished in the top four of a Vinepair tasting of dozens of Oktoberfest lagers. Frankly, I went through the early rounds without giving the beers a great deal of thought, beyond noting that they were enjoyable, and exactly what I’m looking for in a beer at this time of year—something with a slightly caramel malt sweetness, a crisp effervescence and a tangy dry finish. Check, check, check. When I finally put them head to head and actually paid close attention I appreciated them even more. Both beers are a brilliant clear amber in the glass with bright white heads, the SN with a livelier continuing effervescence. In the initial pour the Otter Creek had a slight metallic note in the nose which gave way to distinct fruity aromas. Some residual yeast in the bottle clouded up a late pour and added even more fruity notes to the nose. But the palate immediately reveals a distinct caramel note that remains pleasant and sweet throughout. Not too sweet—this is a quencher, to be sure, with just the right touch of bitterness at the finish. The Sierra Nevada had perhaps a scintilla more color, a cleaner nose with a bready, almost toasty sweet aroma that was immensely appealing. But there was less apparent sweetness in the entry, so sampling it second made it seem somewhat less bold, despite its marginally stronger ABV. But the peppery hop finish is right on here, too, and the overall impression was of a beer in perfect and delightful balance. Buy ‘em, try ‘em. If you like the style, you should find either an excellent representation.